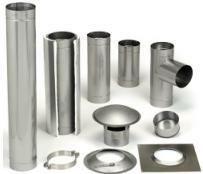 Rigid 304 Alloy Stainless Steel Reline Pipe and Stovepipe. Lifetime warranty for woodburning applications! When used as a chimney liner, Saf-T Liner is UL Listed to the 1777 Standard (where 1" clearance from chimney exterior to combustibles is present) when Saf-T Wrap Insulation is used. We stock 304-alloy Saf-T Liner in 5" - 12" diameters. Only 5" - 8" diameters are UL Listed. Browse these categories under "Heat-Fab 304-Alloy SS Stovepipe/Saf-T Liner"
Featured products under "Heat-Fab 304-Alloy SS Stovepipe/Saf-T Liner"